Today, October 18, 2012 I had another very successful day, even though truthfully I didn't think I'd find anything. I found a Minnie Mouse statue (not pictured) in the display case for sale. I thought it was the cutest thing ever. I will try to upload a picture of it later. The lady behind the counter had to put it under the cash register. It's their policy. I was hoping that I wouldn't forget about it like I did the other time I forgot to get a penguin pin and Abraham Lincoln keychain which I am still pouting over. The 2nd find today was Mickey Ears. 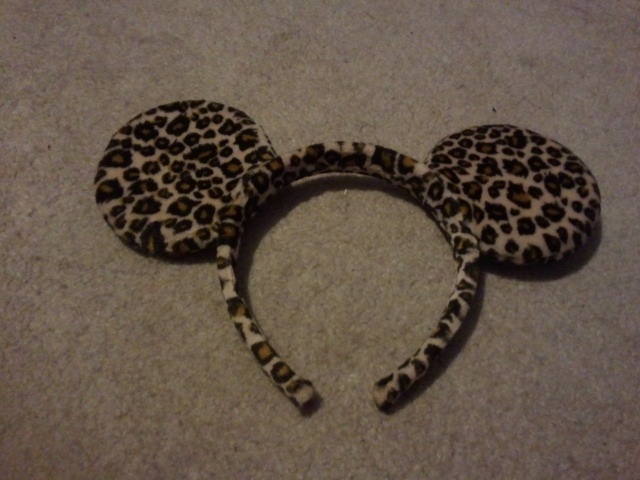 My mom was like "These aren't Mickey Ears." I told her that they were and they were from the Animal Kingdom. The 2nd Find was a Disney World Plate. It matches my hot plate I found earlier this year so I took a picture of them side by side. 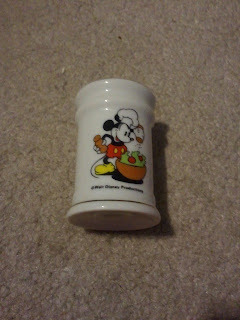 Last but not least, I found a Mickey Mouse pepper Shaker.... I looked all over for the salt one but I guess they did not have it. I guess whoever owned the set either lost the other one or it broke.